From Fla Turnpile or I-95: I-595 West to Pine Island Road; go South on Pine Island Road approx 1.5 miles, park entrance is on your right. From Sawgrass Expressway: I-595 East to Pine Island Road; go South on Pine Island Road approx 1.5 miles, park entrance is on your right. From the north or south on I-95: Exit I-95 at Woolbright Road (Boynton Beach). Go East on Woolbright Road to Seacrest Boulevard. Turn RIGHT onto Seacrest Boulevard, go approximately two miles South on Seacrest Boulevard and turn LEFT into the SEACREST SOCCER COMPLEX at the Aqua Crest Pool and go toward the back of the facility. From Federal Highway (US1): Take Federal Highway to Gulfstream Boulevard at the Delray Beach / Boynton Beach Line. Go West on Gulfstream Boulevard across the railroad tracks to Seacrest Boulevard. 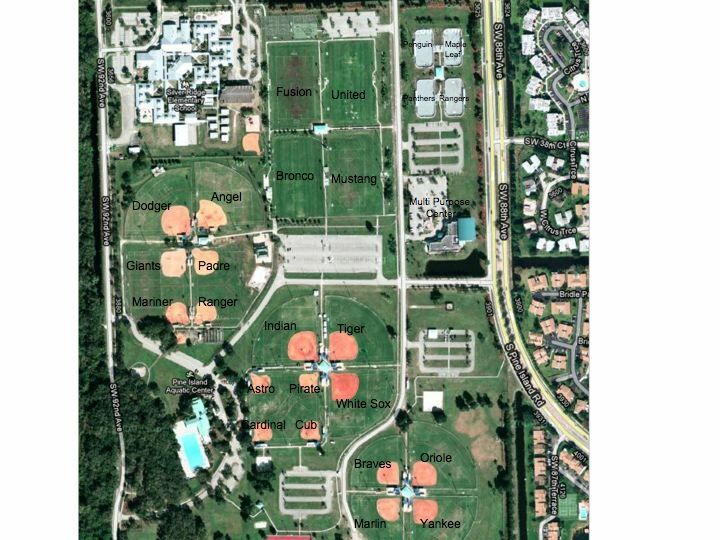 Turn LEFT onto Seacrest Boulevard, go approximately 1000ft and turn LEFT into the SEACREST SOCCER COMPLEX at the Aqua Crest Pool and go toward the back of the facility. From North or South: I-95 to Oakland Park Blvd. Head east on Oakland Park Blvd to Powerline Road. Go right on Powerline Road and head south. Park entrance will be on your right side - west side of Powerline Road. You will see the park to the east as you head north on I-95 just before you get to Oakland Park Blvd. Turnpike north to Jupiter East/Indiantown Rd exit. Go east on Indiantown Road (also known as State Road 706) for about 4 miles (over the bridge) to US 1. Make a left on US 1. Go over another bridge and you will see the fields on the right. Make a right at the next light and then another right to enter the park. 1st light (Island Way), turn left. Go straight for ~ 1 mile and the park entrance will be on your right. From FL Turnpike North/South - Exit # 133, turn right after toll plaza at 1st light onto SW Martin Highway - travel east 3 miles and turn right onto SW Mapp Road, Jock Leighton Park is immediately on the left. From I-95 North - Exit # 102, Palm City exit, travel 2 miles north on High Meadow Avenue. Turn right at the 2nd light SW Martin Highway travel east 3 miles and turn right onto SW Mapp Road, Jock Leighton Park is immediately on the left. From I-95 South - Exit # 110, County Road 714/SW Martin Highway, turn left under I-95 heading east for 8 miles to SW Mapp Road, turn right on SW Mapp Road - Jock Leighton Park is immediately on the left. From I-95: Take I-95 North to Northlake Blvd. Proceed west on Northlake Blvd 0.6 miles to Military Trail. Turn Right onto Military Trail and proceed 1.2 miles to Lilac Street. Right on Lilac Street for 0.3 miles. Field is on the left just before the end of the street. From the Turnpike – Sunpass Only: Take the Turnpike to Bee Line Hwy exit. Turn right onto the Bee Line Hwy, then right onto Northlake Blvd. Proceed to Military Trail. Turn Left onto Military Trail and proceed 1.2 miles to Lilac Street. Turn right on Lilac Street for 0.3 miles. Field is on the left just before the end of the street. From the Turnpike – No Sunpass: Take the Turnpike to PGA Blvd exit. Turn left onto PGA Blvd. to Military Trail. Right on Military Trail. Proceed 0.8 miles to Lilac Street. Left onto Lilac Street for 0.3 miles. Field is on the left just before the end of the street. From I-95: Take I-95 to Northlake Blvd. Proceed west on Northlake Blvd. Turn right on Hiatt Drive. Turn left into park. From the North - Florida Turnpike to Sawgrass Expressway South. Take University Drive Exit, Make right, heading north off the exit on University Drive. Take a left on Trails End. Park will be on the right hand/north side of Trails End - across from Park Trails Elementary School - before you reach Pine Island Drive. From the South - Sawgrass Expressway North. Take Coral Ridge Drive Exit. Make a left off the exit, heading north on Coral Ridge Drive. Take a right onto Trails End. 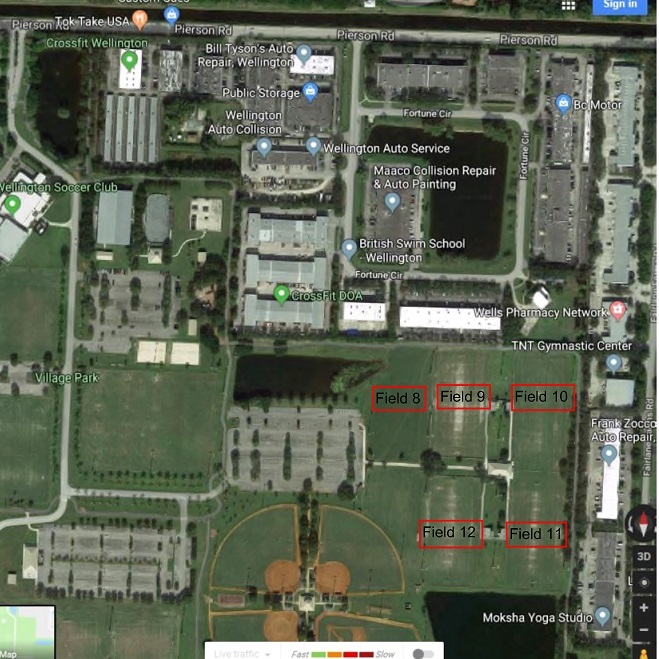 After first stop sign (Pine Island Drive) take a left into Pine Trails Park - directly across the street from Park Trails Elementary which will be on your right/south side of the road. Via I-95 - I-95 South to Sunrise Boulevard. Exit at Sunrise Boulevard and travel West to Northwest 11th Place. Make a left at NW 11th Place and head to first stop light which is NW 70th Avenue. Make a left on NW 70th Avenue and the park will be on your left. Please park in parking lot on North side of field. Via Turnpike - Turnpike South to Sunrise Boulevard. Exit at Sunrise Boulevard and travel West to Northwest 11th Place. Make a left at NW 11th Place and head to first stop light which is NW 70th Avenue. Make a left on NW 70th Avenue and the park will be on your left. Please park in parking lot on North side of field. Take I-95 North to Florida’s Turnpike. Take Turnpike North to Sunrise Boulevard. Exit at Sunrise Boulevard and travel West to Northwest 11th Place. Make a left at NW 11th Place and head to first stop light which is NW 70th Avenue. Make a left on NW 70th Avenue and the park will be on your left. Please park in parking lot on North side of field. Take Florida Turnpike or I-95 to I-595 West. Take I-595 West to I-75 North (toward Alligator Alley). Stay on I-75 North to Indian Trace Exit. After exiting, go 2 miles south past Saddle Club Road. Turn Right into Tequesta Trace Park. Sawgrass Expressway (FL869) to I-75 North (toward Alligator Alley). Stay on I-75 North to Indian Trace Exit. After exiting, go 2 miles south past Saddle Club Road. Turn Right into Tequesta Trace Park. Take I-75 North. Exit onto Royal Palm Boulevard (Old Arvida). After exiting take first right onto Weston Road. Travel about one mile until Indian Trace Road. Take left and head north on Indian Trace for 2.5 miles. Tequesta Trace Park entrance is on left just beyond Tequesta Trace Road. From 1-95: Take Forest Hill Blvd exit and head west for 9.6 miles to Stribling Way. Turn left on Stribling and continue to traffic circle and take right turn at circle. Continue about 500 feet to stop sign and turn right onto Pierson Road. Go about 0.7 miles on Pierson Road to stop sign and turn left into Village Park. Follow park entrance road all the way to the back and turn left at stop sign. Fields will be straight ahead at back of park. From Turnpike: Take Lake Worth Road exit and go west 4 miles to 120th Ave S. Turn right on 120th Ave and go about 0.6 miles to park entrance on right. Turn right into park and continue to stop sign. At stop sign, turn right. Fields will be straight ahead at back of park.